the pink clutch ...: Pink ... all the way down to your toes!! Ok, so I am almost done pulling together pictures for you. Seems like I would have more time without Lawyer home at night, but I have to say I got sucked into 20/20 last night watching the update on Natalee Holloway! I could not peel myself away. Such a sad story!!! 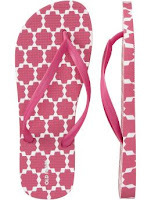 Ok, while you are waiting on posts you MUST pick up some of these adorable flip flops at Old Navy!!! This is my pink photo of the day! Got these yesterday (ok, I bought three different pairs) and love them. And at $5 each you can afford three pairs (maybe more)!!! They are so cute!!! And with the fact that the super retarded weather in Atlanta says it will be 73 today you will probably see me wearing them. Maybe, haven't decided yet!!! Hey--I love the flip flops and I'm all about them! If you are in the mood to spoil yourself a little, check out the ones at JCrew--SO cute! Some have critters, some are just stripes. I have several pairs and LOVE LOVE LOVE them! Keep writing...I love reading it! I do love some flip flops ... I am a kind of whore for them! I will be checking out some JCREW! Thanks for the rec ... and the compliment!! !